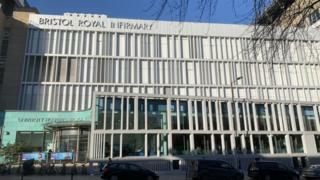 Plans for an 800-space multi-storey car park for visitors and patients at the Bristol Royal Infirmary have been turned down. The hospital wants to demolish 36 flats on Eugene Street for the transport hub which will also have 400 bike spaces. It said the facilities were "essential" to cope with the demands from patients and their families. Opponents have called for "sustainable transport solutions" that would not lead to more traffic and pollution. Bristol City Council's planning committee refused the plans citing the "loss of housing, a detrimental effect on air quality and lack of information justifying the project". Councillor Jo Sergeant said the subject was "quite emotive". "When you're talking about loved ones you don't want them to suffer, and I think that has been played on quite a lot by the trust," she said. "At the moment, I feel like we're almost sort of being emotionally blackmailed into accepting this application." She added the trust should "see what else they can do" or "provide a stronger case" for their proposals. The meeting heard from hospital staff and members of the public about the difficulty some patients have getting to the hospital. The University Hospitals Bristol NHS Foundation Trust estimates that each day 1,200 people with mobility or health problems struggle to get to hospital and rely on cars. Paula Clarke, the trust's director of strategy and transformation, said: "We are very disappointed by this decision because it offers no solution for the frustration and distress caused to patients and families who need parking close-by our hospitals as a medical necessity. "We will review the reasons for the council's decision before deciding upon our next steps."